A newspaper article published by The Central Florida Press on June 20, 1930. 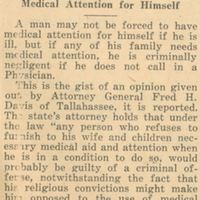 The article describes a legal opinion provided by Florida Attorney General Fred Henry Davis (1894-1937) regarding Criminal negligence and medical care. 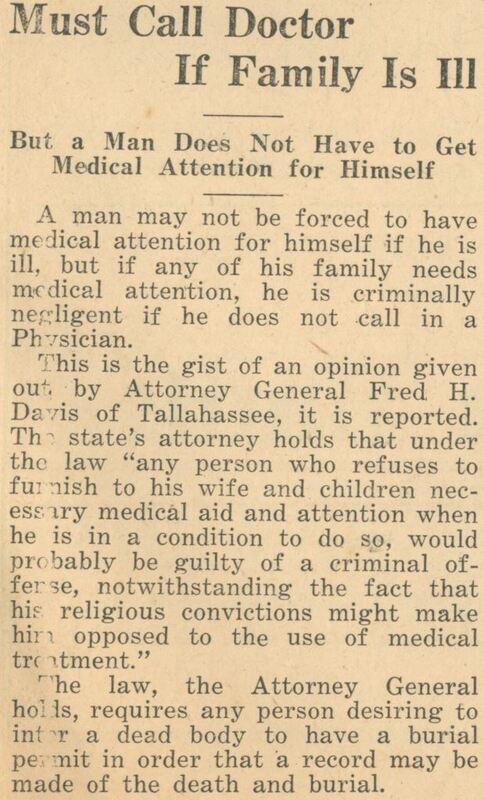 According to Davis, a man is legally required to get medical attention if a family member is ill, but not if he himself is ill. A former lawyer and judge, Davis served as Attorney General from 1927 to 1931, when he was appointed a justice of the Florida Supreme Court, a position that he held until his death in 1937. Before becoming Attorney General, Davis served in the U.S. Army during World War I, then as Leon County prosecutor from 1919 to 1920, and fin ally as a member of the Florida House of Representatives from 1921 to 1927. Original newspaper article: "Must Call Doctor if Family is Ill: But A Man Does Not Have to Get Medical Attention for Himself." The Central Florida Press, Vol. 1, No. 9, June 20, 1930, page 1: Oviedo Historical Society, Oviedo, Florida. Digital reproduction of original newspaper article: "Must Call Doctor if Family is Ill: But A Man Does Not Have to Get Medical Attention for Himself." The Central Florida Press, Vol. 1, No. 9, June 20, 1930, page 1. "Index to Politicians: Davis, E to F." Political Graveyard: A Database of American History. http://politicalgraveyard.com/bio/davis3.html. "Fred Henry Davis." Find A Grave. http://www.findagrave.com/cgi-bin/fg.cgi?page=gr&GRid=10124529. “Must Call Doctor if Family is Ill: But A Man Does Not Have to Get Medical Attention for Himself.” RICHES of Central Florida accessed April 18, 2019, https://richesmi.cah.ucf.edu/omeka/items/show/5688.